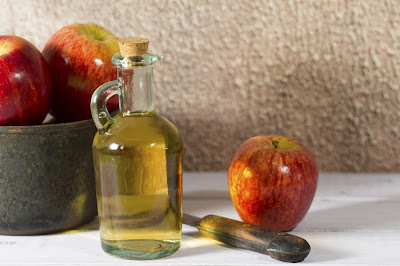 Delicious homemade apple cider vinegar in 3-4 weeks! Choose apples that have a high sugar content and that are fully ripe. Examples include Gala, Red Delicious, Golden Delicious, Fuji and Jona Gold. You can cut the apples into small pieces but this isn't necessary if you have a crusher. After crushing, press the apples in a fruit press and filter the juice through a piece of straining cloth. Set aside 1 qt. of juice and pour your dry yeast in. After stirring the yeast until it dissolves, add the mixture back into the rest of the apple juice. NOTE: Adding yeast to activate fermentation is not essential, but will speed up the process. Pour your juice into containers and fill them to about two-thirds. Cover with cheesecloth and put them in a dark place. The temperature should be around 60° to 80° at all times. Stirring the apple cider vinegar once a day for 3 weeks is recommended, tasting it for desired flavor each time. Full fermentation will take about 3 to 4 weeks. Once at your satisfaction, filter the apple cider vinegar through a cheesecloth to remove the mother of vinegar, this filtration will stop any more fermentation from taking place. Pour your vinegar into a large pot and cook it over low heat, stirring frequently, until the temperature reaches 140°F to pasteurize it. Once the vinegar is cooked, use a funnel to pour the pasteurized vinegar into clean glass bottles. Put the lids on the bottles and set them into a hot water bath to further sterilize them. Allow the bottled vinegar to cool and store it in a refrigerator.